Mr Kurland is Genius! What a great analogy. 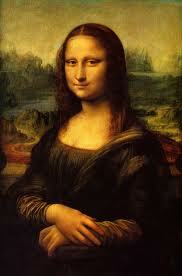 Look at Leonardo da Vinci's painting Mona Lisa, and you see a woman smiling. But you are also aware of a painting. You see different color paint (well, not in this illustration!) and you see how the paint was applied to the wood. You recognize how aspects of the painting are highlighted by their placement or by the lighting. When examining a painting, you are aware that you are examining a work created by someone. You are aware of an intention behind the work, an attempt to portray something a particular way. Since the painting does not come out and actively state a meaning, you are consciously aware of your own efforts to find meaning in the painting: Is she smiling? Self-conscious? Alluring? Aloof? Looking at the Mona Lisa, you know that you are not looking at Mona Lisa, a person, but The Mona Lisa, a painting. You can talk not only about the meaning of the picture, but also about how it was crafted. What is the significance of the dream landscape in the background? Why, when we focus on the left side of the picture, does the woman looks somehow taller or more erect than if we focus on the right side? The more features of the painting that you recognize, the more powerful your interpretation will be. When reading texts, as when reading paintings, we increase understanding by recognizing the craftsmanship of the creation, the choices that the artist/author made to portray the topic a certain way. And yet there is still that feeling that texts are somehow different. Texts do differ from art insofar as they actually seem to come out and say something. There are assertions "in black and white" to fall back on. We can restate a text; we cannot restate a painting or action. Yet a text is simply symbols on a page. Readers bring to their reading recognition of those symbols, an understanding of what the words mean within the given social and historical context, and an understanding of the remarks within their own framework of what might make sense, or what they might imagine an author to have intended.